As we face the dog days of summer, you may want to up your game in the battle against skin damage with sunburn remedies. Turn to the healing properties of essential oils for sunburn relief. These oils may not only treat the burn, but they may also help to restore the skin’s natural, smooth glow. We’ll examine each essential oil and its use in recipes to learn how to make a sunburn go away overnight. Many use essential oils to immediately soothe the ache and pain of a sunburn, remove the redness, and maintain necessary moisture in the skin cells. Numerous oils contain antiseptic, anti-fungal, antibacterial, and anti-inflammatory properties without the added chemicals found in many shelf products. At one time or another, despite our best efforts, we have all had a touch of sunburn. Our skin becomes damaged from the sun and wind. This ailment is often not a serious concern, but continuous skin damage from the sun’s ultraviolet rays can lead to imperfections such as wrinkles and age spots up to the more severe skin cancer. If you’re wondering how to quickly heal sunburn with natural products, we may have the solution for you. Let’s look at which essential oils are good for sunburn. The antimicrobial properties of lavender oil are thought to promote quick healing, and are why this is considered the best essential oil for sunburn. This oil may immediately cool the burn and also contains antibacterial and anti-fungal components to target pain and redness of sunburn. Peppermint oil contains calcium channel blockers to combat pain associated with a sunburn. Its menthol property soothes and cools the burning sensation on contact. Peppermint oil also hydrates the skin at the same time it works to alleviate the pain and tenderness of a burn. Tea tree oil is commonly used to ward off head lice, but its anti-inflammatory and antiseptic properties could also help it protect your skin against the effects of sunburn. This oil might alleviate the redness, pain, and inflammation of sunburn while giving a soothing affect to the skin. Sandalwood oil’s antiseptic properties may treat severe burns, while the natural anti-inflammatory and astringent compounds may offer a cooling sensation and possibly reduce any swelling and inflammation of the skin cells. Geranium oil has long been used to promote clear and smooth skin, and its anti-inflammatory properties could also relieve the redness and inflamed skin cells of sunburn. It might also protect the skin with its antibacterial and antimicrobial components, and work to relieve the pain of sunburn. The inflammation, swelling, and pain of sunburn can potentially be treated with the anti-inflammatory, antiseptic, and analgesic properties of chamomile oil. This oil offers a mild scent while soothing the skin. Try soothing the burning and pain sensations of sunburn with frankincense oil. This oil will hydrate the skin while protecting it with its astringent and antiseptic properties. Using eucalyptus oil could be a great way to pain and inflammation. It has antibacterial, anti-inflammatory, and analgesic properties that may allow relief from sunburn effects while the skin heals. The antioxidant and anti-inflammatory properties of helichrysum oil reportedly work to soothe the painful burning sensation of sunburn and reduce skin inflammation. The oil may help to speed up the healing process and hydrate the skin at the same time. Furthermore, helichrysum might help to block the damage of ultraviolet light that leads to skin cancer. Now that we understand what essential oil is good for sunburn, let’s take a look at how to use these essential oils. The properties of the oils can be potent, and typically require dilution with a carrier oil or other essential oils to prevent the sunburn from becoming worse. We have also included blended oil recipes for how to get rid of sunburn. Combine one drop of the oil and aloe vera gel before applying directly to the sunburn. You can also add seven to eight drops of lavender oil to a warm bath with oatmeal to soothe a case of full-body sunburn. Use one to two drops of peppermint oil with one to two teaspoons of aloe vera gel to create a paste for the sunburn. Add one to two drops of sandalwood oil to 30 grams of coconut oil to create a paste to apply on the sunburn. Add one drop of turmeric essential oil to the blend to boost the antiseptic components. Combine one to two drops of frankincense oil and aloe vera gel. Apply the paste on the affected areas of the sunburn. In a spray bottle, add two to three drops of eucalyptus oil, one teaspoon of aloe vera gel, and one cup of water. Apply to the sunburn at bedtime. You can also use this essential oil for sunburn relief by mixing water with four to five drops of the eucalyptus oil and soaking a facecloth in the mixture. Gently dab the towel on the sunburn. Try one or more of the following recipes for sunburn relief with the use of essential oils. Directions: Add the lavender oil to the yogurt or aloe vera gel in a non-reactive bowl and mix thoroughly. Dip a cotton ball into mixture and dab onto the sunburn. Directions: Add the lavender oil to a basin filled with the water and stir thoroughly. Soak the facecloth and apply directly to the sunburn. Directions: Combine all ingredients in a small non-reactive bowl and add to a tub of warm water. Stir the mixture in the tub and soak for a 15- to 20-minute treatment. You can use any droplets that float in the water onto the sunburn areas. Use the Calming the Burn recipe after the bath for best results. Directions: Combine all ingredients in a resealable glass jar and mix thoroughly. Use a cotton ball to dab mix onto sunburn when needed. Directions: Combine the lavender oil and the vinegar in the glass bottle and shake well. Add six teaspoons of the mixture to a warm bath and mix thoroughly. Soak for a 30-minute treatment. Apply any floating droplets to the sunburn areas. In addition to essential oils for sunburn relief, there are several natural treatments you may want to try. These can be used if you do not have any essential oils on hand. The pure gel from a fresh plant of aloe vera or the gel marketed in the stores can give immediate soothing relief from the sunburn. Pure coconut oil is used as a mild sunscreen, but only offers a protection of 5 to 10 SPF. Use it directly on a sunburn to reduce redness and inflammation. It may also stop any peeling of the skin. You should keep hydrated at all times, but it is especially important with sunburn injury. The burn itself, as well as long periods in the sunlight and heat, can cause your body to lose water. As well as water, you can also enjoy herbal teas. Take a cold shower or bath immediately after prolonged periods of exposure to the sun. Avoid exposing the burn to sunlight by covering the affected areas and avoiding the natural light streaming through windows. Apply a cold oil such as olive oil or vegetable oil to the sunburn to alleviate the redness and pain. Bathe in a tub of water and oatmeal, or use vinegar and baking soda in the bath to soothe a painful sunburn. You can reduce your chances of getting a sunburn in the first place by wearing sunscreen, a hat, sunglasses, and proper covering when in the sunlight. However, sometimes sunburn is just unavoidable. In that case, several essential oils have healing properties that may speed up the natural recovery process. Try using essential oils to treat the pain and discomfort of the burn as well as protect the skin cells from further damage. Just be mindful of allergies and potential interactions with current medications. If you do not have immediate access to any of the oils, there are steps to take for instant relief. A sunburn that presents with severe pain or visible blisters may require medical attention. “5 Best Essential Oils For Sunburn,” Organic Facts; https://www.organicfacts.net/essential-oils-sunburn.html, last accessed August 8, 2017. “7 Essential Oils for Sunburn Relief and 7 Alternative Remedies,” Morning Chores; https://morningchores.com/essential-oils-for-sunburn/, last accessed August 8, 2017. Loren, “7 Essential Oil Based Remedies for Sunburn,” Essential Oils Sanctuary, June 16, 2015; http://essentialoilsanctuary.com/7-diy-essential-oil-based-remedies-for-sunburns/, last accessed August 8, 2017. 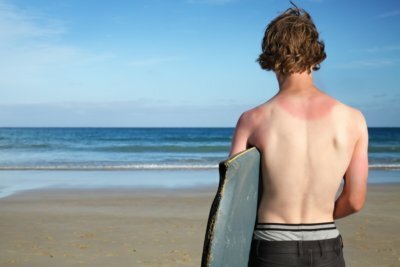 Katie, “Natural Remedies For Sunburn,” Wellness Mama, June 2, 2017; https://wellnessmama.com/3039/sunburn-remedies/, last accessed August 8, 2017. “Sunburn,” NHS; http://www.nhs.uk/Conditions/Sunburn/Pages/Introduction.aspx, last accessed August 8, 2017.